Give the gift of fitness to the cycling, running, or workout junkie in your life. You choose the amount. They get what they want. Everyone wins! Delivered via email or print. 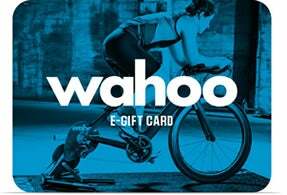 Wahoo Fitness gift cards may only be redeemed toward the purchase of eligible products on http://www.wahoofitness.com/. Coupons may not be used to purchase gift cards. If there are other products in your order, the coupon code will only be applied to those items. Sales tax is not charged on the purchase of gift cards. Applicable sales tax is charged when the gift card is redeemed. If the value of your order is less than the amount of the gift card, the order amount is deducted from the gift card’s balance until balance reaches zero. If the value of your order is greater than the amount of the gift card, credit cards, additional gift cards, or other available payment methods may be used if an order exceeds the amount of the gift card. Wahoo Fitness gift cards cannot be redeemed for cash except where required by law. Wahoo Fitness gift cards never expire. Wahoo Fitness will not be responsible for lost or stolen gift cards. Balances can be checked at http://www.wahoofitness.com/giftcard, or by calling (877)978-1112.